This rhyme packet contains four worksheets, modified from the middle school reading (poetry) curriculum. On the first three pages, students are to circle the words that rhyme. These are basic sight words with the picture and the word. 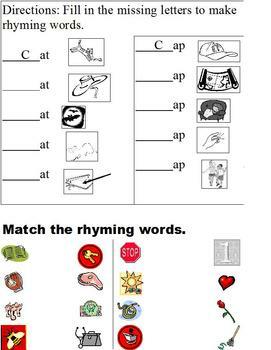 Students can color the rhyming pictures when the worksheet is completed. The fourth page has two sets of word families students will create. 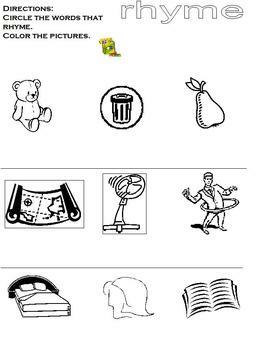 They are to fill in the initial consonant using picture clues provided. At the bottom, students are to match the pictures that rhyme. This is excellent for special education students who require an alternate or modified curriculum. It is also an excellent worksheet for general education students in the elementary grades.